Meanwhile, the National Coordination Group has said we can expect high winds, ice and rain over the next few days. 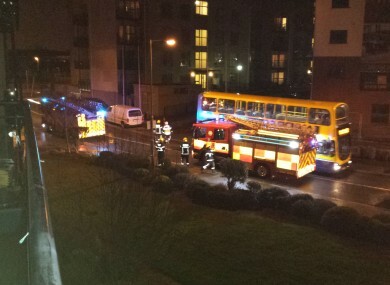 THE WATERWAY APARTMENTS at Ashtown in Dublin are currently being evacuated due to storm damage. Gardaí say this evening that the bad weather led to structural damage to the property. The Ashtown road is currently closed to traffic and road users are requested to use River Road as an alternative. Gardaí, emergency services and the local authority are all at the scene tonight. The gardaí also had this message for people during the bad weather. Meanwhile, ESB Networks says that from 5pm this evening, power has been restored to over 45,000 customers. However, it has a “mammoth task ahead” of itself as almost 215,000 customers remain without power, and over 4000 network faults have been identified. From first light in the morning the restoration process will continue. Due to the scale of the damage, additional crews from other parts of the country have already been drafted in to the worst effected areas in the southwest. The National Coordination Group has warned that we can expect high winds, ice and rain over the next few days. It held a meeting today – which was attended by Minister for Transport, Leo Varadkar – where it looked at all the impact of the storm. It said that in Kilkenny, 52 people had to be evacuated from a nursing home after its roof was damaged. Persons with specific medical concerns are advised to contact their medical practitioners for advice. People are asked to check on vulnerable neighbours in their community in areas without power. People should keep warm and take care with alternative forms of energy. ESB crews will also be prioritising power to infrastructure such as water treatment plants and pumping stations. It says that people should be extremely cautious on the roads, particularly on motorways, and that there is danger from debris, fallen trees and icy roads in the morning. The group recommends people should use public transport where available and allow extra time for journeys. It will be monitoring the situation in conjunction with local authorities, an Garda Siochána and the HSE. Email “Apartments evacuated due to storm damage”. Feedback on “Apartments evacuated due to storm damage”.